Food & Drink - What's Available? Refreshments are available to suit everyone at New Ferens Park, with very reasonable prices. We have two main options for refreshments at New Ferens Park: Extra Time Cafe Bar & the Tea Hut. 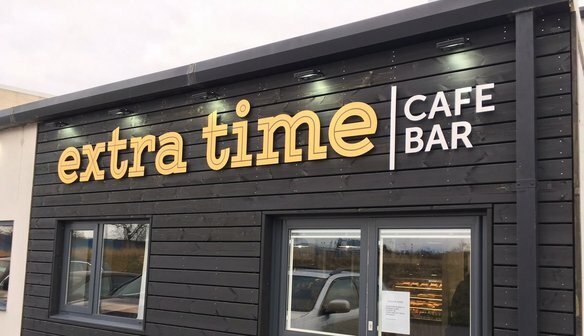 The newly-refurbished Extra Time Cafe Bar offers alcoholic and soft drinks alongside a range of hot drinks, paninis and sweet treats at affordable rates! With comfortable seating, charging points and free WiFi, it's the perfect place to relax before the game or unwind after a thrilling 90 minutes of football! The entrance to the Extra Time Cafe Bar is next to the turnstiles, and once inside the ground you will need to exit in order to enter the Cafe Bar - but don't worry, we'll let you back in! Inside the ground in the Tea Hut, offering a range of hot and soft drinks, hot food and confectionery. There are some healthy options available, too!